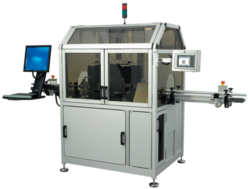 We are recognized as leading manufacturer, supplier and exporter of a wide assortment of Vision Inspection System. These vision inspection system are manufactured using premium quality raw material and advanced technologies. These vision inspection system are applauded for their features like accurate dimensions, efficient performance and long service life. 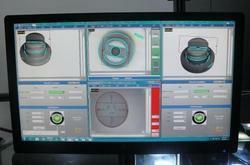 Our valuable clients can avail these vision inspection system from us competitive market rates. Bestowed by a modernized infrastructure facility, our organization is manufacturing, supplying and export a wide gamut of optimum quality Vision Inspection System which are manufactured and designed using fine quality material and as per international quality standards. Offered range of vision inspection system can be availed from us reasonable price. Our Carton Inspection Systems are widely acclaimed by the Pharmaceutical Product Manufacturer, Beverage Machine Manufacturer, Cosmetic Product Manufacturer, Cosmetic Product Machine Manufacturer, Pharma Machinery Manufacturer, Beverage Manufacturer, Pharma Row Material Manufacturer, etc. Thus, we have carved a niche as one of the trusted Track and Trace Systems Manufacturers from India. There is software in the I-PC processes and inspects particular image of the product/object and check that inspection criteria are fulfilled or not. If the product is failed to fulfill pre-defined inspection criteria, Software generates Rejection signal and transfers that signal to the Rejection system so that product is rejected and stores values or images in report file which can be rejected. Rejection System may be Air based or Piston based, depending upon weight and dimension of the product. On receiving a rejection signal, rejection system reject particular part from the line. RegoBliss offers uniq solution for blister inspection for tablet and capluse blistering machine. All can be detected and rejected at rejection station with RegoBliss. For any quiry feel free to contact us.